This section includes comments and glitter graphics to wish your friends and family a great weekend. The weekend is finally here! It's that little mini-vacation at the end of each week that we all look forward to. Whatever your weekend holds in store, don't forget to let your friends know that you're thinking about them. Whether you're heading off for a weekend getaway, going out to see a hot new band, hitting the town, having dinner and drinks with some friends, or even just catching up on some work around the house, weekends are the time to relax and enjoy! So go catch that hot new movie, or take the kids to the zoo, or read that new book, or treat yourself to a trip to the spa! 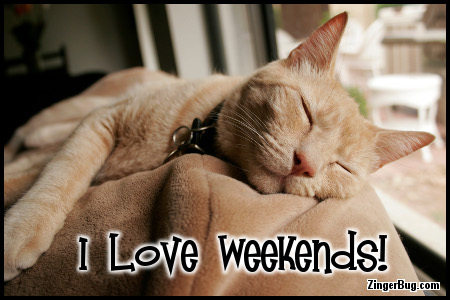 Whatever your plans are, don't forget to wish all of your friends a great weekend too! These images are free for your personal use for email, your phone, or to post on any website, social network page or blog.